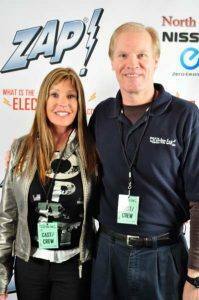 The Rotary Club of Santa Rosa will be hosting Hollywood Film Producer & Author Scott duPont along with Electric Vehicle Expert & Author Ginny Scales-Medeiros on Wednesday, June 10th, 2015. The two authors will speak about the new electric cars & “plug-in” hybrids now offered from all the different car manufacturers. They will also answer the many questions people still have about electric cars. 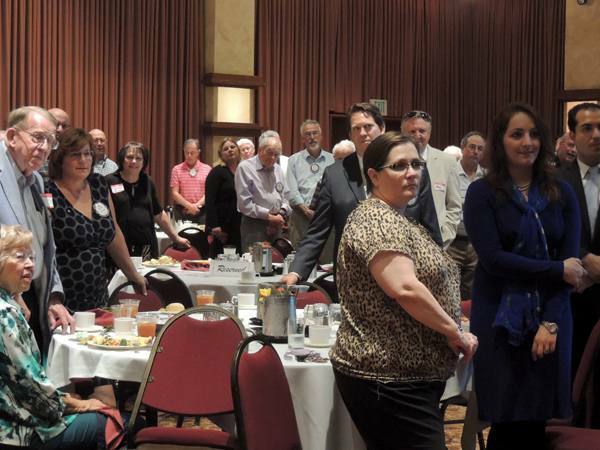 This interesting & informational Lunch event sponsored by the Rotary of Santa Rosa will be held from 12:00noon to 1:30pm on June 10th at The Flamingo Hotel, 2777 4th Street in Santa Rosa. This special “What is the Electric Car?” event & book signing will also be a chance to see a display of some of the new 2015 electric vehicles, as well as some of the new “plug-in” hybrids car manufacturers are now offering. There will also be a FREE raffle with almost $200 in prizes including free books, DVDs, and an original, signed & framed print from Roel Cancio who created all the original artwork for the book: “What is the Electric Car? …79 REASONS to Drive Electric”. The Author, Scott duPont will speak about this new industry and answer questions. Local Santa Rosa resident & contributing Author Ginny Scales-Medieros will also speak about her experience of driving electric cars the past 7 years. Kathleen Archer went on and on about bicycles for some reason? Apparently, there are more bicycles than people in the Netherlands. John Kerry just got into a bike accident – someone give him my card! We have 638 registered riders for the Giro Bello, a good start. Kathleen told us a delightful story about a cyclist and a sports car and ringing bells. Good stuff. We had several visiting Rotarians today! Bill Hatcher introduced them to us. From the Santa Rosa Sunrise Club: Del Raby, Past District Governor, Carolyn Anderson, Past District Secretary, Warren Smith, and Marty Behr. From Sebastopol Sunrise: Past District Governor Bruce Campbell, and Past District Governor Helaine Campbell. From Healdsburg: Roger Olson, who got roundly booed for some reason your editor doesn’t know about. Lots of guests today due to the terrific program we put on: Steve Baime said he brought his wife, but did not name her?! Hmmm. Further investigation revealed her name is Michele. George R, Diane Niones and Barbara Kanowick, guests of Karen Ball, Steve Gospe and Doris Gospe, guests of Jeff & Ann Gospe,, Terry Abrams, guest and wife of Yale Abrams, Eric Goldschlag, guest and husband of Marnie Goldschlag, Abigail Bridgman, guest of the Santa Rosa Sunrise Club and applicant to be a Rotary Peace Scholar, Tom Degenhardt, guest of Jeff Gospe, Melanie Nacouzi, guest of ; Mike Sussman, guest of the Gospes; Diana Young, guest of ?? ; Don McMillan re-introduced us to Jock McNeill, who we’d all like to COME BACK!! 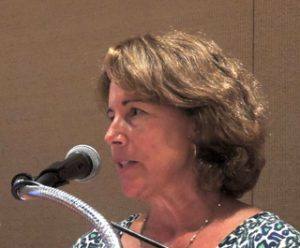 ; and Diane Moresi, ditto! There were several other guests who either did not sign the register or whose introduction was too mumbled to be recorded. Laura Held introduced Jack Abercrombie, Jack Atkin, Ray Foreaker, Ray Giampaoli, Nick Knickerbocker, Steve Reuter, Carmen Sinigiani, and Peggy Soberanis, our June Birthday Rotarians. Singing and gifts ensued. Tim Delaney explained for us what World Community Service does. They give away lots of money and have some really great Rotarians on the committee. They have a budget of $14,000. They are starting to do their own micro-loan program under the direction of Kathleen Archer, and they are hoping to raise $35,000 for that program, which will be down in Colombia. Debi Zaft had Past District Governor Del Raby draw the winning name from the basket of names of all those that answered magazine questions over the Rotary year, and President Mark Burchill won the $100 prize. Debi also announced that Jeanne Levin is doing well post surgery. Kim Graves gave her craft talk. She is a Sonoma County native and suffers through an arranged marriage. She sold business forms for 14 years. She was diagnosed with MS in 2006 and then took 3 years off, but is now living a good life. She works for Safe In Home, a system for keeping track of your elderly parent. Ray Giampaoli does home loans with WJ Bradley, especially for veterans. Ray is a veteran (my sources tell me he was Special Forces (!) and a father of a veteran, and knows what he is talking about in terms of getting home loans, especially for veterans. Laura Held and Kerrie Chambers both owe the Club $10 as they now have their blue badges. 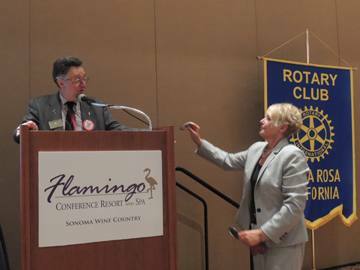 Vicki Hardcastle announced one new Paul Harris fellow, Jock McNeill, and several Rotarians who have completed multiple fellowships, including Roy Thylin, Judy Glenn, Larry Miyano, Jack Tolin, Mark Burchill, Craig Meltzer, Jeff and Ann Gospe, Will Haymaker, Jack Abercrombie, and Kris Anderson. Steve Marburger had Diane Moresi draw the winning ticket, which belonged to Richard Lazevick, but he couldn’t find the right marble and walked away with $10. Karen Ball announced a new social at DeMeo Park, Wednesday, June 17th, 5:30 to 7 whatever. This will be a family event: bring your spouse, kids and anyone you consider your family! Tell the social committee if you plan to attend. Donnie Mac needs more volunteers for the Giro Bello. If you haven’t yet, please volunteer! All hands on deck! I mean it! 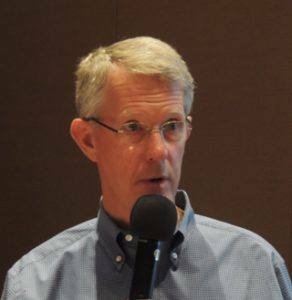 Wayne Rowlands said Rotary Means Business will be at the Pacific Air Museum tomorrow, June 4th, 5:30 to 7:00. Jack Abercrombie announced next week’s program is about electric cars. Bring your guests as this should be a good program. President Mark Burchill confessed a very romantic date at Battle Bots. Jackie McMillan got hacked and then got picked on by President Mark; she did not go the Philippines and did not get robbed. Watch your e-mail security! Karen Ball and Chip Rawson got their picture in the paper, and so of course got fined in true Rotary style. The depth of my desire to be chosen as a Rotary Peace Fellow is based on the experiences I have had, the changes I have seen in myself and others, and the opportunities to serve as a result of those experiences. I will make a strong addition to Rotary’s Core of International Ambassadors. I deeply respect the mission of the Rotary Foundation and will serve with honesty and to the best of my ability in any part of the world. I was born and raised in Afghanistan. Because of the vagaries of history, my life has been defined by conflict-it is the experience of struggle and conflict throughout my life that has driven me, for as long as I can remember, on a quest to understand and create peace in the world. My mother lived with my sister and me in a tent under a bridge. It was a time in Afghanistan when much of the population suffered from famine. My sister and I often survived on only one or two eggs, and a piece of bread every day. My mother frequently went without to provide for us. In most Third World countries, the male is the breadwinner and the head of the family. As the only male in the family, I had to learn responsibility while still a very young child. My father was killed during the Soviet conflict when I was six months old in 1989, the same year the Soviet troops finally left Afghanistan. Throughout the war, over 1 million Afghans were killed, and many millions more were displaced from their homes. There was conflict and hostility everywhere in my homeland. It seemed to me that Afghanistan was hungry for peace, but there was no answer to my question. My mother is illiterate. Yet, she instilled in me the value of education; she insisted that I attend school and work to the best of my ability. In my youth, in hopes of finding work, every day I would take my wheelbarrow to the bazaar. If it happened to be a lucky day, I would make some money by helping people move their cargo. My mindset focused on the fact that no job was too small to help provide for my mother and sister. Years passed. In this way, yet, I never faltered in my educational ambitions while also earning for my family. I graduated from high school at age 16 with the top scores in the entire school as valedictorian. I was proud to be the first in my high school of 6,000 students. Upon graduation I longed to attend college, but family responsibilities and poverty prevented me from doing so. I continue to work to provide for my family. During this time I learned to speak a little English by watching American movies in a coffee shop. One fateful day I went to an American army base to help my uncle, a poor shopkeeper. At the base. I encountered an American Officer who was impressed with my English ability; he offered me an opportunity to work with the US military as an interpreter. Of course, I accepted. In this role, I was able to alleviate misunderstandings between the US forces in the local tribal people. Later as the lead interpreter, I taught Afghan culture courses to American soldiers before they went on their patrols or interacted with the local population. This led to understanding between the cultures and major reductions of civilian casualties. After two years, a new squadron (750 personnel), Nevada National Guard’s 221 Cavalry, Wild Horse Unit, hired me. This was the most effective unit I would have the opportunity to serve during my three years as an interpreter and cultural advisor. I was selected to serve as the primary interpreter and cultural advisor to the unit commander and his senior staff. My interest in the area of conflict resolution arose when I saw the extraordinary result of our newly implemented strategy. The strategy focused on resolving conflicts through peaceful solutions using the Jirga, or tribal council of elders, instead of the more popular counterinsurgency strategy. My duties included translating the entire strategy document of 200 pages, and then testing the ideas in the field as we implemented the policy among the local population. The strategy proved a major success. By sitting down to talk with the elders, we learned their perspective on the situation and listened to their desires. If a village had a history of attacking troops, we would meet with the Jirga and impress on them the importance of mutual respect and understanding. Attacks were reduced by 70% as a result of direct communication with the local population. Brig. Gen. Curtis Scapparrotti has credited me, as the primary national spokesman for this strategy, with the huge success that resulted in the safe return of every member of the Nevada National Guard force. Not one member of the guard was killed. This is the only unit deployed for one year in the entire country with such a record. As the primary interpreter and cultural advisor, my responsibilities included weekly high-level security meetings with the Afghan Minister of Interior, Provincial Governor, Chief of Police, and key members of USAID. I was also privileged to meet and work with many senior American commanders, including Gen. David Rodriguez, Deputy International Security Assistance Force, ISAF Commander. I received the Excellent Leadership Award from the Chief of Staff of the Defense Ministry of Afghanistan, as well as many certificates and military coins in recognition of my distinguished service as an interpreter and cultural advisor. I made many friends while working with the Nevada National Guard. One of the American officers who became my brothers was the deputy commander of the unit. He told me that I deserved a better opportunity. He made a promise: if I could get a visa and admission to an American university, he would bring me to America and guarantee four years of college. Of course, this opportunity was beyond my dreams, but since I had the highest grade in my high school and a record of working with senior government officials, the University of Nevada, Reno accepted me. I was fortunate to be one of four students that received a student visa from Afghanistan in 2010. When I arrived at the university, I joined the International Students Club, where I became involved and spoke to students about my experiences and my home country. I was also the president of the Muslim Student Association (MSA) at the University. My role was to speak against violence and radicalism and promoted the ideals of peace, mutual respect and understanding. Throughout my college career, I volunteered to travel to different cities and taught cultural courses to soldiers about Afghanistan before their deployment. In 2001, I spoke to the annual senior Noncommissioned Officers, military conference about the importance of delivering the right message of peace and understanding. I was awarded the Soldier Creed Award by the Nevada National Guard’s State Command Sgt. Major. I was also the keynote speaker for the University of Nevada Reserve Officers Training Corps Military Ball in April 2011. I continue to travel to different states and university campuses to speak of my life and the importance of world peace and understanding and how to make it work. From the classroom to department presentations and other events, I have taken advantage of every opportunity to speak of peace and the significance of mutual respect and understanding across cultures. In addition to my public speeches, I held many leadership positions at my university. I was a member of the Wolf Pack Veterans Group. From 2013 to 2014, I was the President of Project Duwell, a nonprofit organization primarily focused on improving health care for women and children, both locally and worldwide. We held many events promoting healthcare awareness and raise money to fund construction of a medical hospital in Bangladesh. The program was so successful the 10 of our university students traveled to Bangladesh to help women and children understand and use medicines and first aid kits. At the end of my year as Pres., I received the Excellence in Leadership Award in recognition of my service. Additionally, since my senior year of college, I have been an active member of the Kolvet Foundation, which was founded on the principle of benevolence in action. I participated in many of their feed the homeless projects where we primarily serve women and children. With Rotary’s help, I intend to refine my skills at one of the Rotary peace centers. Such a privilege would allow me to continue to serve and grow my capacity for impact. When selected as a Rotary peace fellow, I intend to focus my studies in the area of conflict resolution. The University of Bradford is my first choice Rotary Peace Center. I am most familiar with Bradford because of Prof. Paul Rogers. During my college years, I would frequently listen to Prof. Rogers lectures on the Internet. I especially remember his thoughts on war and peace issues in both Iraqi and Afghanistan. His thoughts and ideas gave me hope that we will have a stable Afghanistan one day, and that peace will impact neighboring countries as well as the rest of the world. Furthermore, Bradford is known for its diverse student body and faculty. This will provide me with an invaluable experience and allow me to think, question and share a better world understanding through various cultures with my classmates and faculty. My career objective is to work closely with international projects that enhance the stability of our global community. With an advanced degree in conflict resolution, I will have strong impact serving as a mediator working with the UN, NGOs, governmental institutions and charities that operating conflict and unstable parts of developing nations. Since living my entire life knowing real poverty and conflict, I have thought of nothing else but to find ways to bring people together through peace and mutual respect. I have an unwavering commitment to promoting peace throughout the world and to find peaceful ways to resolve conflicts. My past academic successes and community involvement, along with seemingly fated circumstances throughout my life, have prepared me for the Rotary peace Fellowship., It is my goal and at times it feels like my destiny to make an enduring impact on world peace through activism and action. Enhancing my own capacity and understanding through a Masters program focused on peace and conflict resolution will propel me on this path of peace and allow me to better serve the global community.